Years of work have brought DRCNet and our allies near to an historic victory in Congress. Since 1998 DRCNet has campaigned for repeal of an infamous law, authored by drug warrior congressman Mark Souder, that delays or denies federal financial aid to would-be students because of drug convictions. Yesterday a committee of the US Senate approved a bill that among other things would remove the "drug question" from the federal financial aid form -- not quite full repeal, but close -- the fight is not over yet, though, and we need your donations to help us finish the job. Your donations will enable us to lobby hard the next few months to protect this victory and to push to turn it into something even bigger -- full repeal of a federal drug law, something that hasn't happened in the US since 1970. And your donations will turn this already successful campaign into a larger one taking on more "collateral consequences" of the drug war -- mobilizing the groups we've worked with already to repeal similar bans in welfare and housing and voting law, to get sentencing laws changed and more. We've been "pounding the pavement" going to the places we need to be to find the partners we need for this expanded effort, and we need your donations to pay for staff hours to continue and to put those connections to work. So please make a generous donation to DRCNet today, to support this campaign, and to help us take it into the next stage. Visit http://stopthedrugwar.org/donate to make a donation online, or send your check or money order to: DRCNet, P.O. Box 18402, Washington, DC 20036. Donations to Drug Reform Coordination Network to support our lobbying work are not tax-deductible. Tax-deductible donations to support our educational work can be made payable to DRCNet Foundation, same address. We can also accept contributions of stock -- email [email protected] for the necessary info. Thank you in advance for your support. 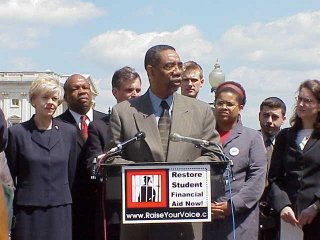 2002 press conference DRCNet organized for CHEAR, with ten members of Congress participating.